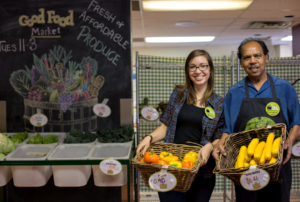 The Stop began over 35 years ago with a mission to increase access to healthy food, while also working to build community and challenge inequality. Our Good Food Market connects deeply to this work. It brings healthy, affordable, and fresh fruits and vegetables into our neighbourhood, but perhaps more importantly, it creates a space for people to gather, share recipes, participate in food demonstrations, chat with friends, and make new connections. Historically, markets have provided people with a space to come together to connect with friends and neighbours. But as food moves out of local markets and into massive grocery stores, the social and community aspect of one of life’s daily tasks is being lost—making us all a little more isolated. Sharing our stories, experiences, and ideas about food is an essential way to build bridges across cultures and to begin creating a broader community. One of my favourite parts of the day is chatting with customers and volunteers at the market to find out what they will be cooking with the produce they’re buying. Last month, we promoted mushrooms as our food of the month at the market, and people shared some highly creative ways of using this versatile fungus. 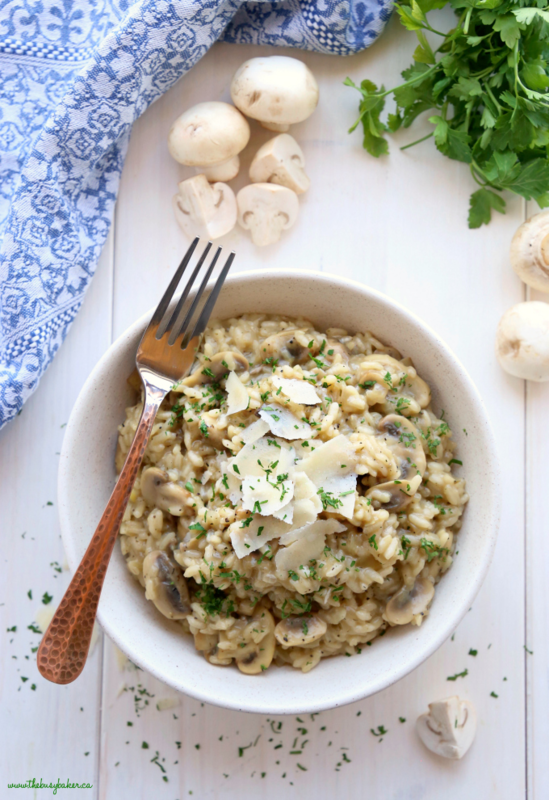 One of my personal favourites is a mushroom risotto (you’ll find a recipe at the end of this post). 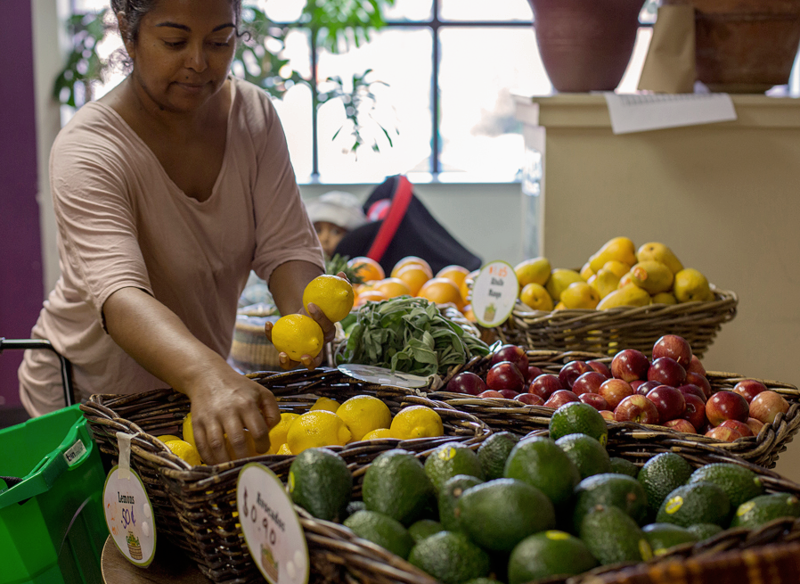 When you come to shop in our market, you’re helping to create a positive space while also supporting local farmers. Through our partnership with FoodShare, we buy as much local produce as possible. Buying local helps farmers sell their produce at a fair price, and it also means you get to enjoy seasonal, sustainable, fresh, and flavourful food! So next time you’re in the neighbourhood, come stop by the market and meet our wonderful volunteers and members of the community. Feel free to stay for lunch (served 12pm-1pm), and be sure to save room for some delicious cake, freshly baked each week by our Community Chef Monica Bettson. Eight volunteers help us to run the market. This represents 32 volunteer hours each week, or 1,632 hours each year. Since September 2018, we’ve served close to 4,000 people! Many customers coming through the doors are here each week, but we also love seeing new faces. Spices you can find at the market: garam masala, curry powder, coriander, cumin seeds, dried oregano, dried parsley, paprika, chili flakes, chili powder, cayenne pepper, thyme, bay leaves, turmeric, and cinnamon. Once the butter is melted, add the onion and garlic and sauté until the onion is soft and translucent. Add the lemon juice, thyme and salt and pepper. Add the wine and stir as the wine reduces (cook for about 5 minutes until the wine reduces). Turn the heat to medium-low and add the rice. Toss the rice in the onion mixture until it’s coated and move it around the pan for about 1 minute. Add the hot chicken stock (or vegetable stock) about 1/2 cup at a time, stirring constantly and waiting until the stock is absorbed by the rice until you add another 1/2 cup. Repeat the process above until all the stock has been added and absorbed by the rice and a creamy sauce has formed, stirring constantly throughout. Serve immediately with shaved Parmesan cheese and freshly chopped thyme.